Rove, who intends to take out the first Ohio elector he sees. WASHINGTON—Sources confirmed this afternoon that a heavily armed Karl Rove has positioned himself atop the Electoral College clock tower and is planning to pick off at least 50 electors with a high-precision sniper rifle. 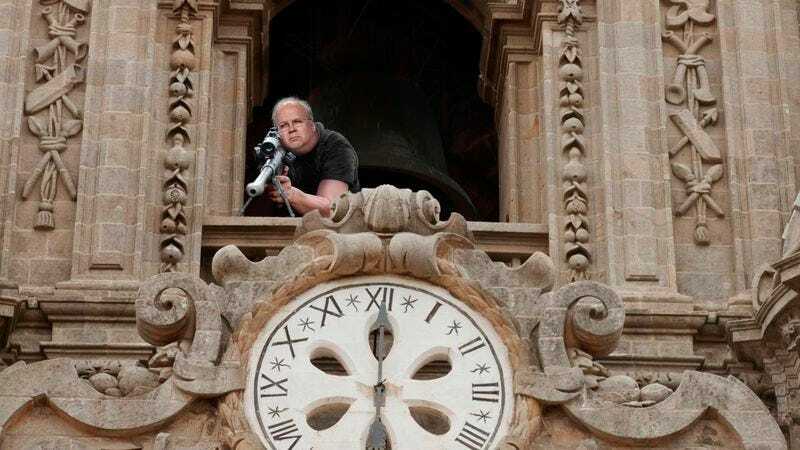 Wearing a black tactical ammunition vest with multiple submachine-gun magazine pouches, a holster containing an extra semiautomatic handgun, and several M67 grenades clipped to the chest, Rove reportedly walked up 27 floors to the top of the clock tower, which overlooks the Electoral College’s main quad area and offers the Republican strategist a perfect vantage point to assassinate electors as they exit the Swing State Dining Hall and the Twelfth Amendment Science Building. Law enforcement officials said Rove appears to be primarily targeting Electoral College attendees from Ohio and Florida. According to FBI representatives, evidence of Rove’s assassination plot was discovered inside the Fox pundit’s off-campus studio apartment. Amidst old newspapers, weeks-old pizza boxes, and rats, agents said they found an Electoral College yearbook in which multiple faces had been crossed out with red X’s. In addition, officials discovered several composition notebooks filled with Rove’s psychotic musings, including his 2004 plans to seize control of the entire country, and a passage in which he graphically describes how he wants to slit Electoral College president Nate Silver’s throat and then bathe in his blood while staring at his naked body in the bathroom mirror. One notebook, sources confirmed, was just page after page of the words “Hamilton County” written over and over again. As the standoff continued, FBI agents said they were having difficulty getting through to Rove—a 2000 Electoral College graduate and basketball standout—and told reporters that special reinforcements needed to be brought in. At press time, Rove detonated one of his grenades, destroying the clock tower and sending his dismembered body parts cascading to the ground.